Radioactivity of Shale Drill Cuttings. Marcellus waste increase attributable to new rules, errors – News – The Times-Tribune. Database: Marcellus Shale Waste Jan. to June 2011 – Data Center – The Times-Tribune. The Capitol Pressroom for June 29, 2011 | WCNY Blogs. Gary A. Abraham of Allegany is one of many small town lawyers living and working in upstate NY who have questions about gas-drilling and local control. The big question Abraham has: Will the SGEIS trump any local bans already in place? What’s next for the Seneca Nation? NY missed the July 1st deadline to apply for federal funds to create a healthcare insurance exchange. Now what? Blair Horner and Elisabeth Benjamin will have an update. ESDC guru Ken Adams on balancing the state’s economic development goals with local control. PHARSALIA – A local law barring any radioactive materials from disposal at the Pharsalia Landfill would have to be changed if Chenango County decides to go into the business of accepting rock cuttings brought to the surface during the process of well drilling. As more natural gas is being produced from the Herkimer Sandstone in the northern part of the county, lawmakers have been weighing the potential revenue from taking in the formation solids versus uncertainty about whether the deep subsurface rocks and soils will be too dangerous to dispose of safely. However, Chenango County Department of Public Works Director Randy Gibbon said the 40-page lab document’s summary sheet proves there were “units of radiation” indicated because the gross beta and gross alpha tests were reported as ‘less than’ certain levels, but not zero. “It doesn’t matter what the level. As long as there’s radiation at all, we can’t accept it with our local law,” he said. More in-depth analysis of uranium 238, radium 226, thorium 232 and potassium, among other isotopes, would be required to cancel out electromagnetic energy, Gibbon added. But he said it most likely wouldn’t be a matter of Norse going back for more tests. “You are never going to get zero,” he said. Local Law No. 3 enacted back in 1989 prohibits radioactive waste in the county’s landfill. The law was later amended and made even more restrictive when parcels in Chenango County were being considered for a low level radioactive waste dump in the early 90s. As a result, everything entering the Pharsalia Landfill, including cell cover and refuse from the county’s transfer stations in Norwich and Brisben, is first passed through a Geiger counter set at three times the background level for radiation. The landfill’s Geiger counter was set at levels recommended by the New York State Department of Health, Gibbon said. The detection device has rejected loads of garbage twice through the years. Norse contacted Gibbon to recommend a testing laboratory, and paid $2,000 to Upstate Laboratories for the analysis. A commercial hauler contracted to truck construction debris from Norse’s well sites invested in equipment specifically to handle the additional business. Mike Holden, whose Whitney Point company has taken refuse off Norse’s well sites since 2007, said he invested “five figures” last summer to purchase new equipment for the tailings. He said he is still waiting to see which direction the county is going to go in. “It would have been a great market for me and for the county, too,” he said. Public Works Committee member Peter C. Flanagan, D-Preston, commented that the best place for the formation solids would be to leave them on site. Town of Otselic Supervisor David J. Messineo warned that spreading them on the surface and enabling rain and surface water to mix in could leach the material’s radioactivity level to greater degrees. “We have a huge aquifer in South Otselic to worry about,” he said. City of Norwich Public Works Superintendent Carl Ivarson said the city’s water treatment plant would no longer accept leachate from the Pharsalia Landfill if the law were to change to permit radiation. 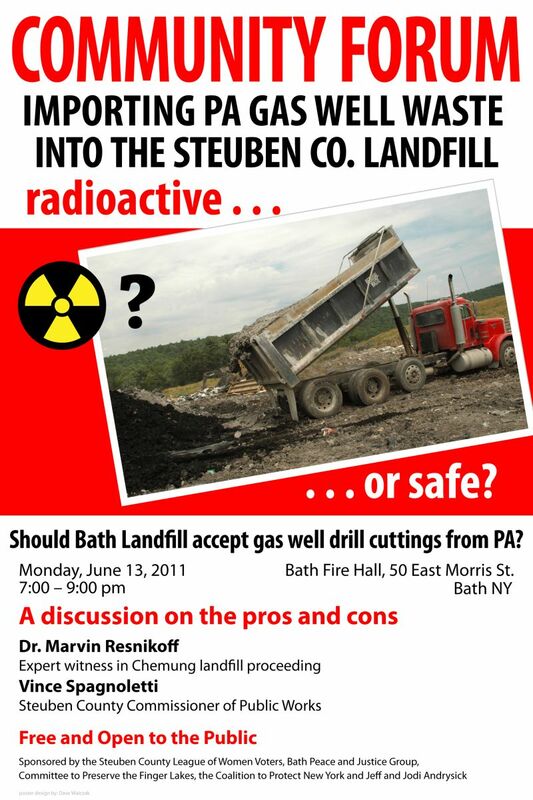 NORWICH – Radiation is already in the Pharsalia Landfill despite a local law intended to exclude it, says Cornell Cooperative Extension Director Ken Smith in a letter to the Chenango County Natural Gas Committee Jan. 31. Smith’s claim contradicts what the county’s public works department director insisted during a meeting of town supervisors last month, that absolutely no radiation at any level was permitted in the landfill. The Chenango County Public Works Committee was interpreting a recent laboratory analysis of drill cuttings from a Norse Energy well site in Smyrna. Using a testing company recommended by the county, Norse had invested in the screening as a precautionary measure. “Regarding radioactive materials being admitted to the Chenango County Landfill, everything that has ever been delivered to the county landfill has contained radioactive materials, and everything that will ever be delivered to the Chenango County Landfill will contain radioactive materials,” said Smith in his letter to the gas advisory committee. Even though the lab declared that radiation was undetected in the cuttings, Department of Public Works Director Randy Gibbon said some units were present as indicated by ‘less than’ arrows, but not zero. Gibbon backed up his refusal of the waste with Local Law No. 3, an ordinance enacted in 1989 and later amended in the early 90s when parcels in Chenango County were being considered for a low level radioactive waste dump. And therein lies the misinterpretation. According to Smith, the local ordinance refers to radioactive waste as defined by the Nuclear Regulatory Commission, or items that have become contaminated with radioactive material or have become radioactive through exposure to neutron radiation such as contaminated clothing, filters, equipment and tools, medical tubes and syringes and laboratory animal carcasses and tissues. “I think that these are the sorts of materials that the supervisors intended to restrict. … I do not believe that it is the intent of Local Law Number 3 to prevent acceptance of all naturally radioactive material,” Smith said. Based on the large number of jobs and increased revenues from Marcellus Shale development in Pennsylvania over the past two years, Smith said taking in the drilling solids could mean “significant economic importance to Chenango County.” Supervisors on the natural gas advisory committee have suggested using the material as cell cover at the landfill. A private hauler from Whitney Point, that regulary contracts with Norse to take consturction debris from well sites, recently purchased trucking equipment to dispose of the cuttings. The loads could mean revenue for them, as well as for the county. Smith also said tht the City of Norwich’s refusal to accept leachate from the landfill if formation solids were permitted is unrealistic, noting that every aquifer in Chenango County receives water leached through radioactive rock deposits. “I think it may be important to make clear that all soil, water, and air naturally contain radioactive materials. Also, all plants and animals naturally contain radioactive materials,” he wrote. In earlier conversations with this reporter, Smith said all residential water wells located north of state Rt. 20 in upstate New York are drilled in the Marcellus Shale formation (because it is much shallower there and outcrops in the town of Marcellus) with no public concern about radiation or heavy metal content in drinking water. On a separate topic, during a recent Regional Natural Gas Committee meeting, it was clear that many in the audience were worried about the toxic effects of methane, the primary component in natural gas. Smith said methane, which is biologically inert, is a normal, non-toxic component of drinking water in many locations and that developing the natural gas deposits from shale poses no risk to the water or air. “We all have methane in our digestive systems every day of our lives. One recent study in West Virginia found that methane was present in 70 percent of the drinking water wells tested,” he said.